At some point, I want to submit my de-conversion story, however it is not complete and will no doubt be very long. For now, I wish to share a growing discomfort (I can think of stronger words that may be more appropriate. )with many religious people, especially Christians. I have read others submissions pointing out very similar attitudes and have found them so true from my point of view also. Today is April 28, 2011, the day after the worst tornado outbreak in recent history, here in the southern United States. In my area of central South Carolina, we had a round of severe storms and one, unconfirmed, tornado. 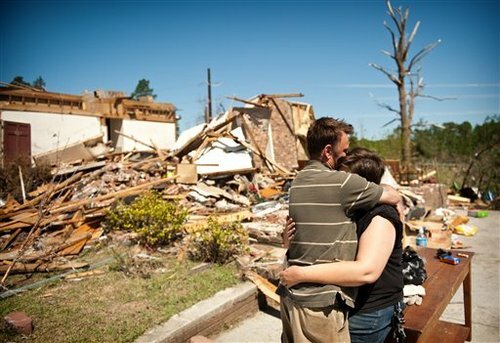 The damage was mostly mild, and extremely mild compared to parts of Mississippi, Alabama, and Georgia. Of course, many people on Facebook were talking about not only the severe damage in other states, but the more minor damage here. Lots of them were saying things like "praying for everyone in Alabama" etc. etc. I have learned enough, especially recently, to realize that praying does nothing, besides waste time, and perhaps make the person who is praying feel a little better. Even so, I realize that many, if not most of these people, have genuine feelings for other humans, who are suffering, and that they have been taught all of their lives, and therefore believe, that praying somehow helps. So, even though it was slightly annoying to see all of the posts with "praying" this or that, I understood that the poster's hearts were probably in the right place, although donating to the Red Cross, or actually getting out and helping would certainly be a better alternative. "We had minor damage, but everyone is okay: GOD IS GOOD!" I kid you not, both of them, posting separately, said pretty much the exact same thing after acknowledging that they had very little damage from the storms. These posts made my blood boil! I wanted to post something back so badly, but didn't dare, for fear that all of the Christians in this "buckle of the Bible Belt", would realize that I was no longer a believer in this non-sense. Anyone in this area, not professing the Christian Faith (or at least faking it) is shunned, to say the least. "Sure god is good; it was only a coincidence. Everyone knows that the Muslim religion isn't true." This is yet another example of Christians just "knowing" their world-view trumps everyone else's. Just ask them, they will tell you! Theirs is the "one true" religion and the "one true" god! Everyone else is going to spend eternity in agony! I'm done ranting and welcome any comments. Thanks for this website and the people who post here. I have received encouragement and consolation from reading many of the posts.